One prominent NASA scientist believes that we will find life on Mars by 2019. Peter Smith, who led NASA’s Phoenix Lander Mission, made that prediction at a recent presentation at the University of Delaware. I used to think that Mars was probably dead, but used to harbor life millions of years ago. 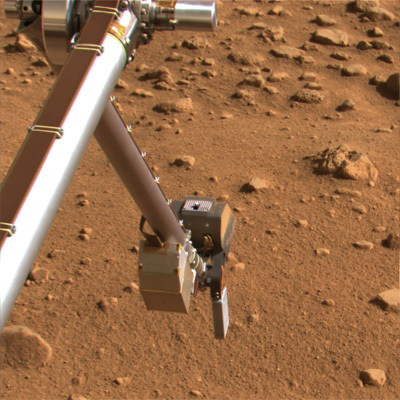 But due to recent findings of the Phoenix mission and the twin rovers Spirit and Opportunity, I do think there’s a chance that we’ll soon find microbial life beneath the soil surface. I certainly hope he’s right… more at Fanboy.com. President Obama recently further confirmed his promises on boosting science funding and “restoring science to its rightful place.” But unfortunately NASA has not been mentioned nearly as much as other government science organizations. Phil Plait over at Bad Astronomy expresses his worries about this and the fact that Obama still hasn’t appointed a new NASA Chief Administrator. I’m inclined to agree… though I should make a point that overall this is a huge win for science and reality in general, and we’re already making vast improvements over the last 8 years of putting politics and ideology before scientific truth. Oddee has a great post today about 10 amazing and fascinating natural phenomena. I’ve seen a few of these myself, including mammatus clouds, but none quite so dramatic as those pictured. If you’re Nashvillian reading this, you’ve surely heard about the recent carjackings and robberies in East Nashville. Unfortunately 3 close friends of mine were victims of one of the carjackings, 2 of which received gunshot wounds. They are all fine and recovering, but these people were all heavily involved in our great local music scene and instantly the scene has rallied around them to help with their medical expenses. Jeremy Ferguson of Battletapes has volunteered to put together at least one, if not several benefit shows for these guys. I’ll post more info as soon as dates and lineups are confirmed. It’s possible that there may be a silent auction at these shows, and if there is I will probably put some framed prints in it. Thankfully, it seems that all 3 suspects have been caught. 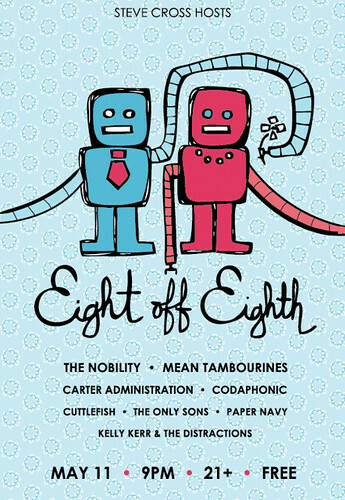 As I’ve mentioned before, I’m curating an 8 off 8th at Mercy Lounge on May 11th. It’s gonna be a great one, and I urge you to mark your calendars and plan to attend. As always, it’s free and 21+. Here’s the awesome flier, created by Alicia and Drew at Monkey Ink Design. Spread the word!